Chronic foot pain from overuse, medical complications from diabetes, and foot deformities are all reasons patients seek our help. We always aim to initially treat ailments with less invasive methods. Foot surgery is treated as a last resort when conservative methods have failed to relieve severe or chronic pain. The Center for Podiatric Care and Sports Medicine in New York City offers a team of highly credentialed and experienced foot and ankle surgeons who specialize in the most advanced surgical techniques. While each individual case is unique, you may find some of our general answers to frequently asked questions to be helpful. Dr. Geldwert counsels a patient in New York and answers all his questions about foot pain. – You have pain severe enough to limit daily activities and diminish happiness. – Your choice of footwear has become extremely limited due to deformity. – You have tried other methods that have not been successful. – You have suffered chronic pain for six months or more. In our experience, conditions like arthritis, bunions, ingrown nails, Duchenne muscular dystrophy, and diabetic foot ulcers often benefit greatly from surgical intervention. How long does ankle and foot surgery take? Sometimes patients are concerned about how long procedures might take. Some surgeries can be done in as little as 25 minutes. The average foot and ankle surgery takes just one hour to perform. However, complex foot reconstructions could take up to four hours. Do foot and ankle surgeries hurt? – Advocating rest and relaxation! Most patients agree that there is some level of pain with a surgery. Pain from soft tissue surgeries typically subsides within three days. Surgeries involving bone may cause intense pain for five to seven days during which we’ll prescribe medication to help you through it. Where are ankle and foot surgeries performed? Minor operative procedures may be done right at The Center for Podiatric Care and Sports Medicine outpatient facility. In that case, you will be able to go home right after your procedure. In other instances where more monitoring is required, you will need to report to our surgeon’s affiliate hospital. You may need to stay overnight to ensure that there are no complications and that your pain is well managed before you are sent home. Often, people need to make plans for a leave of absence in advance of their surgery. Recovery time can vary from case to case. Generally speaking, most injuries require two to six weeks of total healing time, with one or two weeks off work and a few weeks of light duty. Depending on what type of procedure will be performed, we can give you an estimate of how much time you should plan to be out of commission. 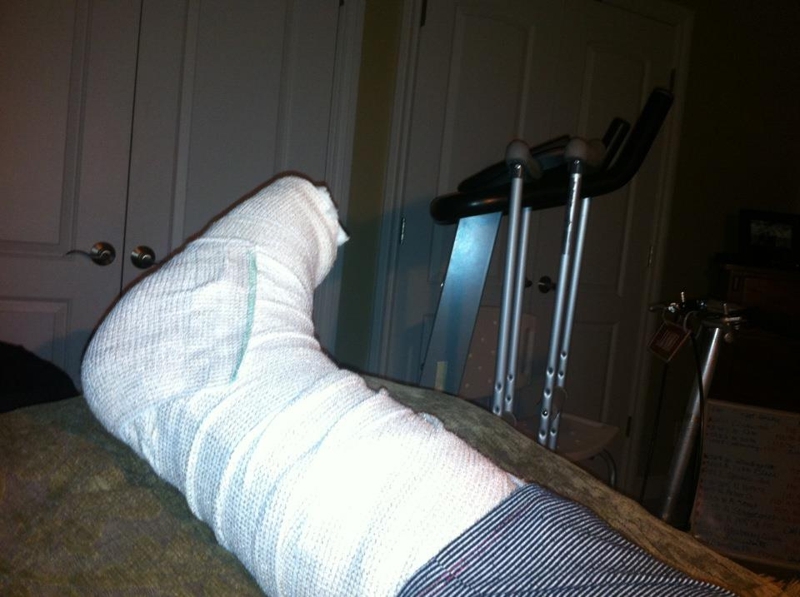 You won’t be driving any time soon if your foot is in a cast like this! If you are having surgery on your right foot, you will not be able to drive until you return to wearing your regular shoe comfortably. Also, if you are undergoing full anesthesia, you will need someone to bring you to your surgica l appointment and remain there for the duration of your surgery to drive you home. Keep in mind that most insurance companies will not cover the damages of an accident involving a person who is recovering from foot or ankle surgery. Can I get the wound wet? We allow patients to shower and wet the area as soon as any special post-operative dressings have been removed, which could take up to a week or two. Avoid changing your dressing unless your doctor grants permission to do so. Wound dressings not only keep contaminants out, but they may also hold tissues in place and control swelling. You may need a shower bag like the one above if your doctor says you cannot change your dressing right away. Our podiatric surgeons use the latest minimally-invasive techniques to minimize the risk of scarring. We use elevation, compression dressings, silicone pads, and antibacterial washes to limit the risk of infection and inflammation. These best practices, in turn, help prevent scarring. There are no guarantees that you will be completely without a scar, however. Most of the time, the sutures we use will dissolve on their own within 14 days. Moisturizing and avoiding too much sun will also help your surgical wound recover. Once your health insurance deductible has been met, your provider will help you pay for the surgery. We will work with your insurance provider to ensure you receive the maximum coverage possible, but it’s always best to call your insurance company prior to surgery to learn what they will or will not cover. Usually, you only pay the surgeon’s fee prior to surgery. Bills from the surgical center and anesthesiologist come later. For more information about ankle and foot surgery, please contact us today.